SM220-M242 is the next generation modularized Solid State Drive (SSD) with the shape of M.2 form factor, with the aim to be the more suitable for server and compact computers with standard width at only 22.00 mm. SM220-M242 appears in M.2 2242 mechanical dimensions and is believed to be the leading add-in storage solution for future host computing systems. 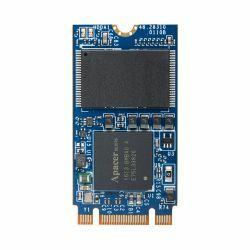 The M.2 SSD is designed with SATA-based connector pinouts, providing full compliance with the latest SATA Revision 3.2 interface specifications. Aside from SATA compliance, SM220-M242 delivers exceptional performance and power efficiency. On the other hand, the extreme thin and light form factor makes SM220-M242 the ideal choice for mobile computing systems, which appears to be the trend in near future. Regarding reliability, SM220-M242 is built with a powerful SATA controller that supports on-the-module ECC as well as efficient wear leveling scheme. Since it is operating under SATA 6.0 Gbps interface, SM220-M242 is provided with Apacer latest S.M.A.R.T. that are primarily oriented for the latest SATA interface SSD, for drive lifetime monitoring and analyzing.